An “arresting” new sibbing from select parents bred from a wild strain of Phal. bellina which is endemic to Sarawak on the island of Borneo, a strain that is highly prized in southeast Asia by collectors, hobbyists and hybridizers ! This sibbing carries a strong wild species vigor, not seen in typical Phal. 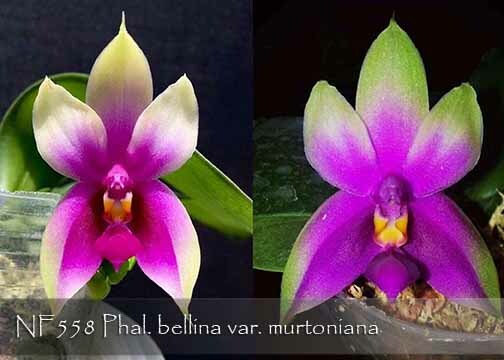 bellina breeding, and its fragrant flowers exhibit petals that reach up rather than horizontal, almost as if it has been “arrested” by the viewer with its “hands up”. Our photo shows a first bloom seedling, in just a 2.5” pot, with an abundant suffusion of its rich lavender flush on all the segments. Highly Recommended ! ,Note: Very vigorous strain, Fragrant!